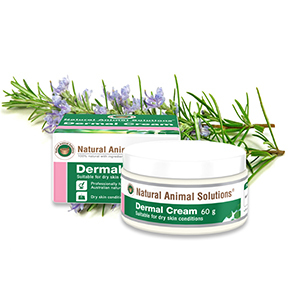 Natural Animal Solutions Dermal Cream is a natural alternative, suitable for dry and broken skin. Furthermore, it is easy to apply, deeply nourishing and also nongreasy. Moreover, it contains 10 key ingredients including the finest natural plant extracts for your pet’s skin. Many pets will experience dry and damaged skin due to seasonal changes, dietary requirements, health concerns and also other conditions affecting their overall wellbeing. Thus, Dermal Cream has been developed to help moisturise and nourish your pet’s skin. As a result. Dermal Cream is a unique, luxurious product that will help improve the appearance of your pets skin. Which is also an ideal nourishing cream. You will notice the changes to their skin as the cream quickly penetrates and moisturises the delicate layers. Dermal Cream is a non greasy formulation using 10 key ingredients to improve the outward appearance of your pets skin, including nose, pads and elbows while also acting as a moisture enhancer.